In honor of today's book launch of Bud to Boss by my friend and colleague Kevin Eikenberry, I'm featuring a guest blog post from him. If you buy his book TODAY, you'll receive several FREE gifts. Check out the bonuses HERE and enjoy Kevin's insights on ways you can help others celebrate their successes. Celebration is often a challenging topic for leaders. They wonder if they should celebrate and when they should celebrate. They waffle between “we don’t need to celebrate, people know we are succeeding” and celebrating every, single, little thing along the way. The best answer (as is the often the case) lies somewhere in the middle. Celebration is important and it can be overdone. Most of the conversation and consternation is typically about celebrating (or not celebrating) success. However, the element of celebration most often forgotten is celebrating progress towards a goal. You should consider celebrating progress for two basic reasons – focus and momentum. In the midst of long projects or in the pursuit of big goals, focus can get lost. People can be so busy that they miss the progress. They are so busy in the forest that they miss the trees they have just passed or chopped down. When you recognize progress it helps renew focus while re-energizing the team. In addition, the intangible momentum that is so easily seen in the athletic world is just as real in your business or organizational pursuits. Celebrating progress is one way to create and sustain momentum towards your goals. So, the question is, how do you do it? I’ve separated the dozen suggestions here into two categories – the results components (basically what and when to celebrate) and the process components (how to actually celebrate). Let’s get right to them. In order to celebrate progress, you must know what progress you have made. Any good project plan (that’s an article in and of itself) will have milestones attached to it. Look at those upfront, and determine when might be good celebration points. Of course how the project is going in real life and in real time may alter your plan, but start with a celebration plan attached to the most important or strategic milestones. Have other people let you know when a celebration might be needed, and get them involved in both the celebration planning and execution. When people feel ownership it will be more meaningful and real. I’m not suggesting abdication or total delegation, but a collaborative process. It is OK to celebrate! Let people know how much you appreciate their effort and progress. Keep the celebration in perspective. The celebration is of progress and that should be clearly stated. It’s important that people know that you aren’t done yet. Balancing the previous point, don’t make the celebration a veiled attempt to get people to work harder. Any message that sniffs of “we’ve made good progress, but it is time to redouble our efforts” will be seen cynically, and may have a negative impact on morale and productivity. Let people know how much you appreciate their effort and progress. If you aren’t really feeling it, perhaps better to delay the celebration until you do – or until you get yourself a leadership attitude adjustment (another great article topic!). The way to a man’s heart may very well be through his stomach . . . and . . . any celebration is better with food. Your situation will dictate how fancy or informal it is, but having food always makes a celebration better. It needn’t be big or elaborate, but it needs to be an event! Make sure people know when it is, and make it a priority that they be involved. A celebration should be an event. While you could do your celebration anywhere, progress celebrations especially are often done when people feel they are still busy with the work. Creating the celebration onsite may balance people’s need to “keep working” with the need you see for celebration. When to celebrate will really be dependent on the demographics of your group, their habits and the culture of your organization. You might consider your celebration first thing in the morning, at lunch or, even, after hours away from the office. Use the wisdom and advice of others to make this decision, rather than following your own personal preferences. Gifts can be a great addition to your celebration. How about a t-shirt, a gift card or something else? Again, culture and preferences will play a role here – get others involved so gifts is perceived as valuable (not just ANOTHER coffee mug or pen). Remember to make sure the value of the gift is congruent with the point of progress. Symbols are really a form of gift, but perhaps with less utility. Plaques, certificates or a hundred other things can be powerful reminders of the appreciation and progress that have been made. Hopefully these 12 suggestions will help you make your celebrations of progress more successful and meaningful. 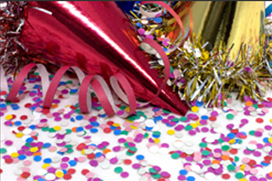 Remember when used effectively celebrations can create focus, momentum and even greater morale and productivity. Kevin Eikenberry and Guy Harris’ new book, From Bud to Boss, launches TODAY. To celebrate the launch, they are offering special bonuses to everyone who buys the book today. Find the bonuses, as well as more information about the book, click here.